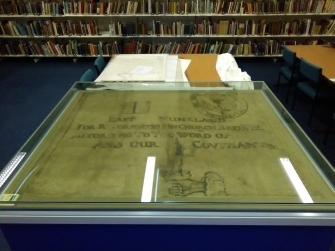 The banner is on permanent display in the Airdrie Discovery Room on the first floor of the library. For current opening hours and further information, see the library website. The East Monkland (now New Monkland parish) banner was carried by John Main of Ballochney (NS 797676) at the Battle of Bothwell Bridge. He appears to have escaped the aftermath of the battle and does not appear on the fugitive roll of 1684. His family remained at Ballochney for many decades afterwards and the banner was kept by his descendants for over 200 years. In the 1870s it decorated the bar of the Gushet House Inn in Airdrie, where William Main was the publican. In 1895 it was gifted by the Main family to Airdrie Museum. In 1999-2001 the banner was the subject of a restoration project, costing £10,000, by the Scottish Museums Council Textile Officer. The banner contains a Bible, thistle logo and a hand holding a dagger. It bears the inscription, EAST MUNKLAND FOR REFORMATION IN CHURCH AND STATE ACCORDING TO THE WORD OF GOD AND OUR COVENANTS. Some of the inscription has worn away.